Please join us for our annual General Meeting on Thursday, May 24. 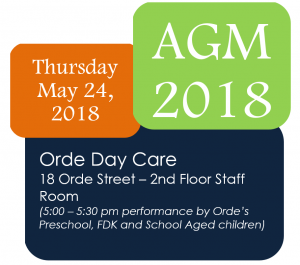 2018 at the Orde Site, 18 Orde St starting at 5:30 p.m.
Dinner, refreshments and childcare will be available for those attending. Invitations and nominations will go out shortly, Hope to see you there!